It's that time of year when the world's greatest tennis players gather at the All England Club in London to take part in the most famous bat and ball tournament of them all - The Wimbledon Championships. I quite like tennis, but unfortunately I'm not very good at it. It's highly unlikely that I'll ever find myself on Centre Court at SW19 in my PE kit with my racket and balls. 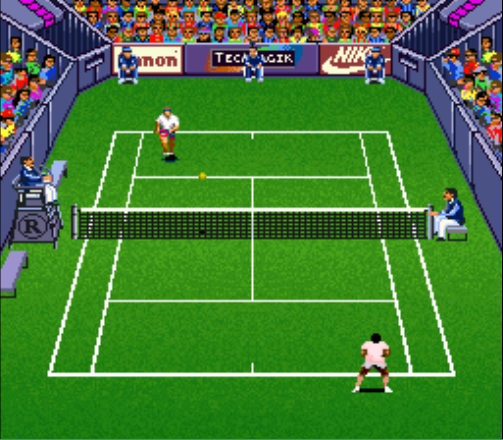 But, I don't want to feel left out, so my plan is to partake in a few games of tennis from the comfort of my settee. Oh yes, I'm going to play a few tennis video games. All on one machine to compare and contrast. And the machine on which its tennis games are going to be rigorously compared and contrasted is the good old Super Nintendo. And first to the bat is Andre Agassi. 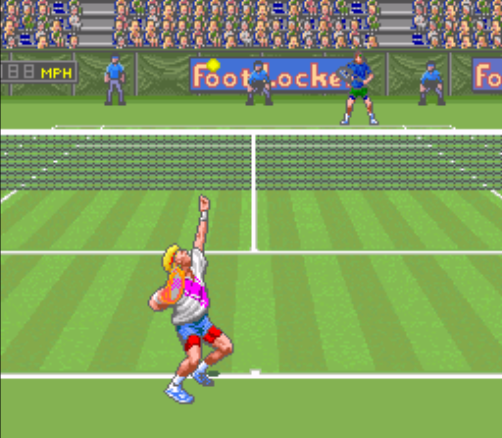 Agassi was one of tennis' biggest stars in the 1990s so it was inevitable that he would pop in a video game based on the sport. 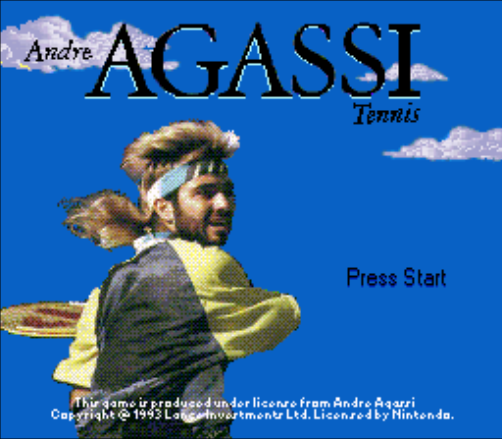 Andre Agassi Tennis was released on the SNES in 1992 and is quite a simple version of the game. It all looks a bit plain and feels a bit rough around the edges. Gameplay comes to a sudden stop after each point is won and the controls could have done with a bit of refining. It's a functional version of tennis, but a bit dull. How do you convince the public that your game is worth playing? Why, call it amazing of course. That'll trick them. Just like Sega and their "Great" sports game series for the Master System, most of which were turds. 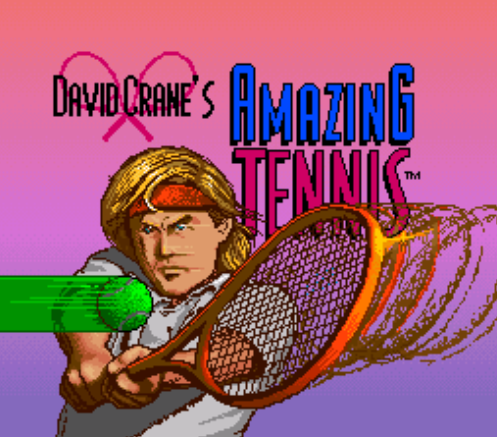 Despite what David Crane thought about it, his Amazing Tennis isn't amazing. It looks and sounds fantastic, and initially it seems to control ok. But, it has one major problem. The court is viewed from a low perspective. Although this does immerse you more in the game, it makes it difficult to judge the depth of the court and to know where the ball actually is, especially when you're on the far end. You also don't have full visibility of the width of the court, which makes it hard to make use of all of it. Sometimes, your player isn't even on the screen as the camera follows the ball, not the player. It's nice to see developers attempting something different, but there's a reason why most tennis games use a more traditional angle. Just for clarification, David Crane is a game developer, not a tennis player. He's most famous for bringing us Pitfall! Another game which uses a low perspective, although not quite as low as David Crane above. 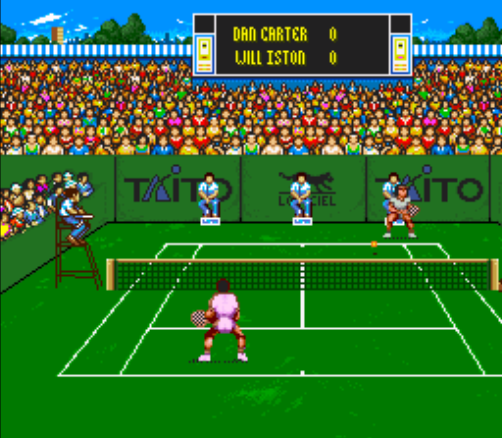 The court is also viewed from a distance, which gives better visibility of the gameplay, even if it makes the court look tiny. This is actually quite a fun game, and is much more forgiving than other tennis games, perhaps a little too forgiving. You somehow manage to pull off shots even though it clearly looks like you've missed the ball. The ball also seems to float over the net which makes things a bit easier. 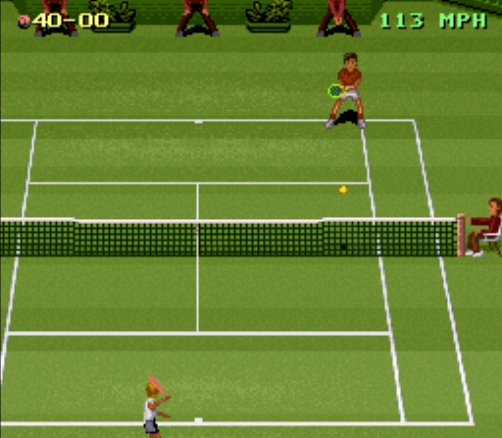 Worth having a look at if you're after an arcade-style tennis game. Is it bad that I've never heard of Jimmy Connors? 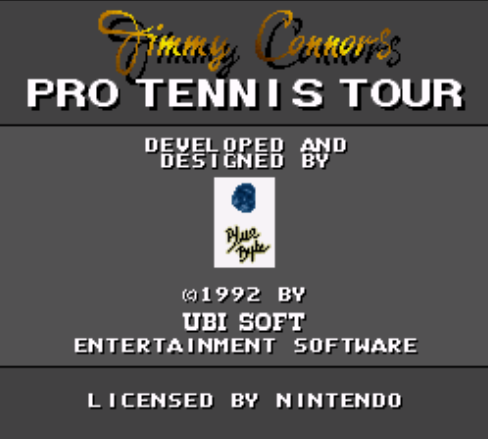 If it's realism you're after, Jimmy Connors Tennis is the game for you. You can perform all kinds of shots with the many buttons available on the SNES controller, although I'm not too convinced that you're fully controlling what's going on. It isn't the most attractive of games to look at, but it plays a good game of tennis and has a surprising amount of depth. To get the most out of this game though, you do need to invest time and effort into it. It's not immediately accessible and getting to grips with the controls isn't easy. 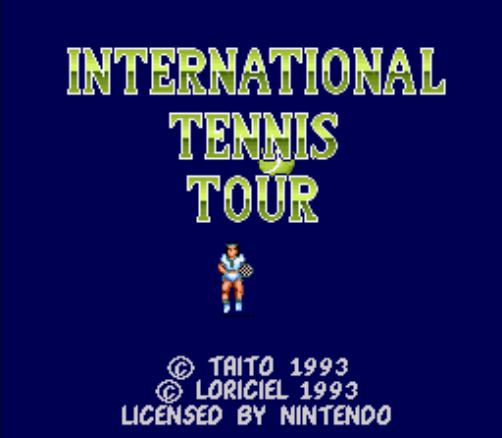 The earliest tennis game on the Super Nintendo, and easily the best. 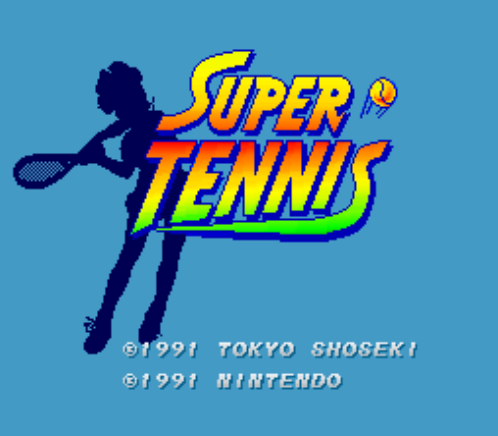 Super Tennis shows off some of the then-new console's 3D abilities, but these don't interfere with the game. The controls are responsive and the multitude of shots that you can pull off with the variety of the buttons feels natural. The game doesn't bog you down with statistics and options and suchlike. Instead, it just plays a great fun game of tennis. 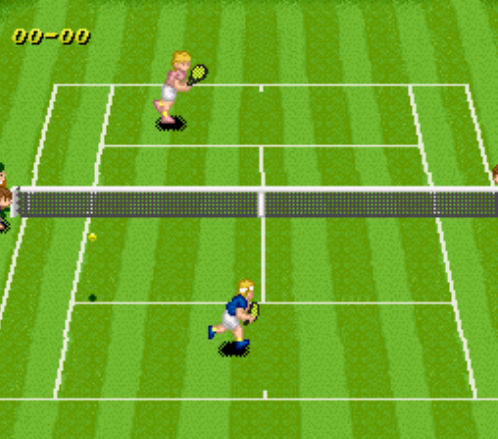 Super Tennis probably remained untouched as the best console tennis game until Virtua Tennis hit the Dreamcast ten years later. Interestingly it never saw a rerelease on the Wii's Virtual Console. Quick! Run away from that ball!